The Universal Journal of Microbiology and Biochemistry (UJMB) is an open access journal that publishes research analysis and inquiry into issues of importance to the business community. 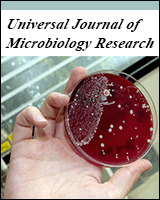 Articles in UJMB examine emerging trends and concerns in the areas of Microbiology such as Environmental Microbiology, Clinical Microbiology, Immunology, Viriology, Bacteriology, Phycology, Mycology and Parasitology, Protozoology, Microbial Ecology, Probiotics and Prebiotics, Molecular Microbiology, Biotechnology, Food Microbiology, Industrial Microbiology, Cell Physiology, Environmental Biotechnology, Genetics, Enzymology, Molecular and Cellular Biology, Plant Pathology, Entomology, Biomedical Sciences, Botany and Plant Sciences, Soil and Environmental Sciences, Zoology, Endocrinology, Toxicology. The Journal welcomes the submission of manuscripts that meet the general criteria of significance and scientific excellence. Papers will be published approximately one month after acceptance. All articles are peer-reviewed.